We've seen 3D printers accomplish both amazing and terrifying things over time. Device owners have created everything from miniature replicas of famous landmarks to gun components, depending on their whims. However, 3D printing has never been a great way to create multi-material, colorful objects - unless you have access to one of the more expensive machines on the market. 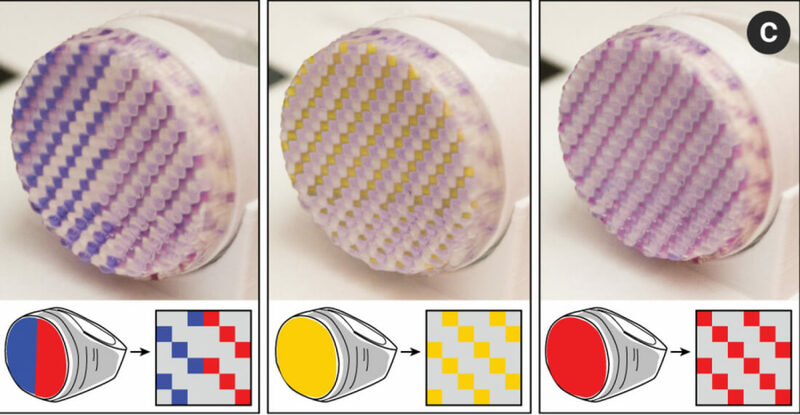 To get around this problem, MIT Researchers from the university's Computer Science and Artifical Intelligence Laboratory (CSAIL) have come up with a new method of 3D printing, dubbed "ColorFab." ColorFab will take advantage of the CSAIL team's custom-made ink which features "photochromic," light-reactive dyes. Within ColorFab's printing panel, users will be able to select which pixels they want to activate or deactivate at any given time. After roughly 23 minutes of waiting and exposing the ink to light, its color will shift. Thus far, the CSAIL team has only managed to create a ring with this technology but they believe its future uses extend far beyond jewelry. Eventually, researchers hope to make the tech available to the garment industry but not just for the sake of improved looks - by allowing users to change the color of their clothing and jewelry on demand, researchers hope to reduce waste. "Largely speaking, people are consuming a lot more now than twenty years ago, and they're creating a lot of waste," said MIT professor Stefanie Mueller. "By changing an object's color, you don't have to create a whole new object every time."